This review first appeared in the July 19, 2007 issue of the North County Times. 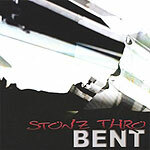 A hard-rocking five-piece from the Inland Empire region, Stonz Thro's debut CD is a muscular bit of arena and pop rock hearkening back to the late 1970s and early '80s. Drawing on everything from Van Halen to Led Zeppelin, Judas Priest to Loverboy, the 10 songs on "Bent" are built around the sharp guitar playing of Shannon Smith and the confident metal-styled singing of Mike Folston. Despite Folston's dramatic singing style, though, this is not metal  not even early '80s pop-metal. It's far more melodic than most metal, and the keyboards of Scott Berry are far too prominent for a true metal sound. Rather, it's more akin to vintage Ted Nugent  loud, aggressive music with an accessible, pop-oriented sheen to it. And on "I Don't Know," the band even switches gears for a power ballad with Folston showing a deft touch on the sentimental side. All 10 tracks were written by the band  no obvious hits, but some nice tunes played with energy and skill. It's a fun, listenable bit of the kind of rock-as-excess that's been lost over the past couple of decades.